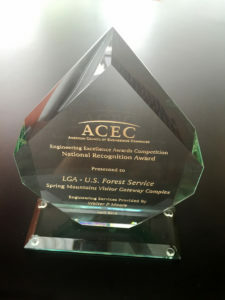 American Council of Engineering Companies presented award April 19 in Washington, D.C.
LAS VEGAS – The American Council of Engineering Companies honored Las Vegas firms Walter P. Moore and LGA each with a National Recognition Award as part of the 2016 Engineering Excellence Awards competition Tuesday, April 19, for their work on the Spring Mountains Visitor Gateway project. Walter P. Moore served as the structural engineer for the project, and LGA, the architect. 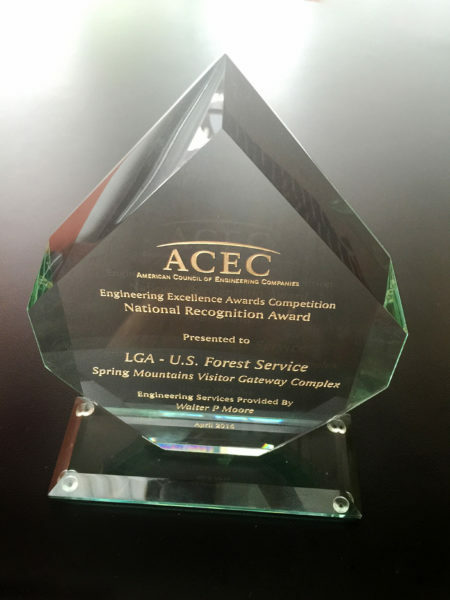 The gala took place at the Washington Marriott Wardman Park in Washington, D.C.
LGA principal Craig Galati attended the gala and received the award — a prestigious distinction honoring projects that demonstrate exceptional achievement in engineering — on behalf of the firm. Established in 1986, LGA is a cross-disciplinary, client-centered consulting firm that brings together the disciplines of architecture, sociology and sustainability using a collaborative, participatory and community-based process. LGA has been a longtime advocate of green design and green living. Celebrating its 30th anniversary this year, the firm is best known for its work on the LEED certified Springs Preserve master plan; the Desert Living Center at the Springs Preserve — at the time, one of only a handful of Platinum LEED certified buildings in the world — and, most recently, the Spring Mountains Visitor Gateway, constructed with smart building techniques.